$3,399.99 This may be in stock for quick delivery; please call! The G6120RHH Reverend Horton Heat model is built to the Rev. 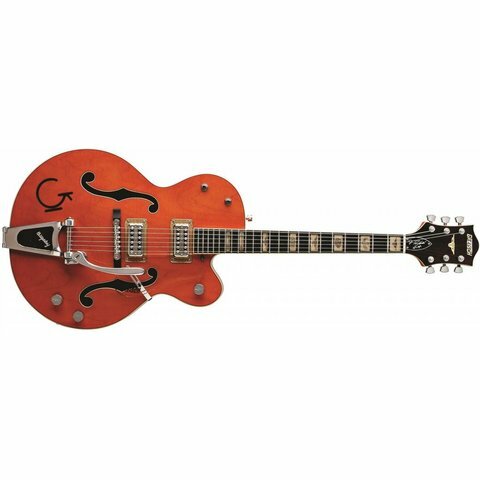 's own specs and rocks a distinctive combination of 1955-style Gretsch western motifs and 1958-style pickups and controls. Features include TV Jones Classic pickups, pinned Adjusto-Matic bridge, Gotoh locking tuners, clear pickguard, "G" body brand, bound oversized F Holes, stained maple headstock overlay, multiple aged body bindings and aged fingerboard and headstock binding. The aged vintage wide-block pearloid inlays feature a western motif of cactus, steer heads and fences, and the headstock features pearloid steer head and Gretsch logo inlays.